Laparoscopy, also known as keyhole surgery, is the art of performing surgeries through small 0.5-1.5cm incisions using tiny specialised telescopic instruments. A laparoscope is a narrow tube with a camera and lens attached to it. The advantages of laparoscopic surgery over the traditional open incision surgery include decreased postoperative pain, decreased bleeding, a shorter hospital stay, earlier convalescence and recovery, with complications such as chest infections, clots in the legs and lungs minimised with early mobilisation. Laparoscopic urology uses these minimally invasive keyhole techniques to treat conditions affecting the kidneys, ureters, bladder and prostate. Advances in technology assist surgeons to perform laparoscopic procedures to treat a wide range of urological conditions with potentially better outcomes. Dr Louie-Johnsun is one of the high volume laparoscopic urological cancer surgeons in Australia and has performed over 500 major laparoscopic cases in his first six years of clinical practice with the majority of operations for prostate and kidney cancer. He was Fellowship trained in advanced laparoscopic techniques in the UK by Mr Chrisotpher Eden who has one of the highest volumes of laparoscopic radical prostatectomies in the world. Dr Louie-Johnsun has been an instructor, facilitator and presenter at various laparoscopic courses for urological and general surgeons including The Minimal Access Therapy Training Unit (MATTU) which is an internationally recognised centre of excellence for the teaching of innovative laparoscopic surgical techniques in Guildford, UK and also in a live animal surgery lab in Elancourt, France. Besides presentations at national / international meetings and published personal results on laparoscopic radical prostatectomy, Dr Louie-Johnsun has also published and presented his techniques for less common advanced laparoscopic procedures including single port laparoscopic (LESS) nephrectomy and laparoscopic urological emergencies. This is keyhole surgery to remove the entire kidney. A simple nephrectomy is the removal of a kidney for noncancerous disease whereas a radical nephrectomy is usually for a cancerous growth and involves the removal of one kidney together with the adjacent tissues around the kidney usually including fat, lymph nodes and often the adrenal gland. The kidney might need to be removed because it no longer functions and causes pain and infections or because of an abnormal presumed cancerous growth. The aim of the operation is to completely remove the kidney and the surrounding tissue (in the case of surgery for a suspected kidney cancer). Traditionally this operation was performed through a large incision either at the front of the abdomen or alternatively at the side of the rib cage. Whilst this approach provides good access to the kidney it is associated with greater post operative pain, slower recovery and a prolonged convalescence period with a higher wound complication rate. Laparoscopic nephrectomy, in contrast to open is performed through small incisions in the skin and small tubes called ports are then placed into the abdominal wall allowing access to the kidney. Specialized instruments including telescopic cameras are then used to allow improved, magnified vision and precise surgery. Tumours up to 10-12cm can often be treated laparoscopically although this does depend on the position of the tumour and if there is any evidence of local extension of the cancer. The operation is performed under a general anaesthesia and most patients spend 2 nights in hospital before returning home with usual resumption of normal activities within 4-6 weeks. This is a surgical procedure similar to laparoscopic nephrectomy except the surgeon removes the kidney together with the ureter, the tube that carries urine from the kidney to the bladder. Laparoscopic nephroureterectomy is used to treat patients who have a specific cancer of the ureter or kidney called urothelial carcinoma. If you need surgery for an abnormal presumed cancerous growth in the kidney, your entire kidney may not need to be removed. Depending on location and size of the growth, you may be able to undergo surgery tp remove the growth itself surrounded by a small rim of normal kidney tissue whilst preserving as much normal healthy kidney tissue as possible. This surgery is called a partial nephrectomy or kidney (nephron) sparing surgery. Am I suitable for a laparoscopic partial nephrectomy? The added potential risks with having a laparoscopic partial nephrectomy include bleeding, urine leaks, incomplete cancer removal and conversion to open surgery. You should discuss your individual risk based on your clinical scenario with Dr Louie-Johnsun when considering these treatment options. At the junction of the renal pelvis (where urine is collected after being produced by the kidney) and the ureter (the connecting tube between kidney and bladder) there can be a blockage. This is called a PUJ (pelviureteric junction) obstruction. In the majority of cases this is a congenital narrowing (people are born with this problem). A significant proportion of people affected with this condition will also have additional blood vessels to the lower part of the kidney which can kink the PUJ resulting in a blockage. Although many cases are detected in young children, many do not cause problems until years later in adulthood. Most commonly pain is felt in the affected kidney at times when large volumes of fluids are consumed. This increase in fluid intake results in more urine being produced with the net effect of dilatation of the system above the blockage which causes pain. Traditionally this problem has been corrected with an open operation. The results of this operation are excellent but the down side is the problem of a large incision which can cause significant pain, slow recovery and be cosmetically unappealing. 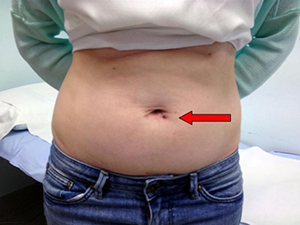 An example of a traditional incision is demonstrated below. Over the years, attempts have been made to treat this condition using endoscopic techniques (operations performed internally from the bladder without the need for any skin incisions). The obvious advantage is that there are no incisions. However, the disadvantage is that the success rates of these treatments is around 15-20% less than treatments where the blockage is removed and the PUJ reconstructed. Laparoscopic pyeloplasty (keyhole repair of the blockage) has the advantage of formally reconstructing the PUJ combined with the avoidance of a large incision and the problems that go with it. Laparoscopic (keyhole) pyeloplasty is performed while under general anaesthetic (patient is asleep). Four small incisions (cuts in the skin) are made and ports or tubes are then placed in these holes. Specialised instruments and telescopic cameras are then used to remove the narrowed segment and to reconstruct the system. At the end of the operation a stent (small plastic tube) is left internally. The tube passes from the kidney to the bladder and is removed a few weeks after the operation once everything has settled down. The purpose of the stent is to allow the system to remain at low pressure and to encourage the new joint to heal. Although most stones can be treated with endoscopic surgery such as laser lithotripsy, large stones will often require 2 or 3 attempts for completely clear the stones. Laparoscopic surgery for kidney stone removal is a minimally invasive option to remove a large stone without fragmentation by laser in a single operation. Surgery for prostate cancer is called radical prostatectomy (RP). It involves complete removal of the prostate gland and can be performed via a standard open incision or keyhole / laparoscopic surgery. Keyhole or laparoscopic radical prostatectomy (LRP) is a minimally invasive technique that can be achieved with or without the assistance of an expensive robotic machine. Traditionally radical prostatectomy was performed through a single incision that extends from the pubic bone to just below the umbilicus (belly button). For laparoscopic prostatectomy we use 5 small incisions through which ports are placed and specialised instruments and telescopic cameras are then inserted through the ports to perform the surgery in a precise manner facilitated by magnified vision. When comparing keyhole/laparoscopic with open radical prostatectomy the benefits / advantages include improved visualisation, reduced blood loss with almost elimination of blood transfusion, reduced post operative pain, fewer wound complications, a shorter hospital stay and earlier recovery with a more rapid return to normal activity and work. Pure laparoscopic prostatectomy without robotic assistance is only performed by a handful of surgeons in Australia, partly due to the intensive training that is required to become proficient and training centres located primarily in Europe where this was pioneered. Dr Louie-Johnsun was trained by one of the world pioneers and authorities on laparoscopic prostatectomy who has one of the highest volume of cases in the world. This is keyhole surgery to remove the entire bladder (together with prostate in males) usually for muscle invasive bladder cancer. This complex surgery is only performed laparoscopically by a handful of surgeons in Australia. The urinary tract is then reconstructed with either an ileal conduit or neobladder.